We treat our residents like family and they dine together in smaller groups of 8 – 12 at one dining table. Those living with dementia and memory disorders may become overwhelmed in a large dining hall with too many residents. 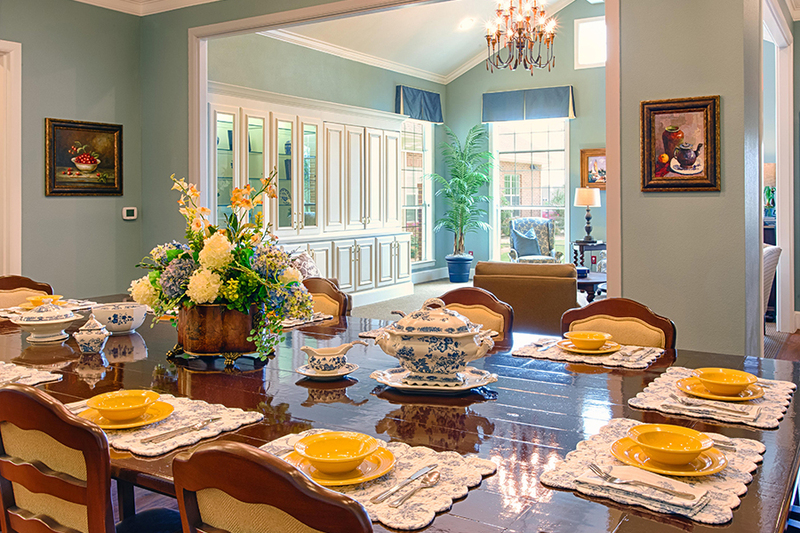 Our family-sized dining rooms are one more way that The Cottages feels more like home. Preparing appealing foods and those that meet nutritional guidelines are essential for those living with Alzheimer’s and other memory disorders. Our on-site, executive chefs consider color, taste and texture with each and every menu item they prepare. Completely prepared and cooked onsite, our chefs use the freshest ingredients for three meals daily plus snacks. Maintaining hydration is important for our residents, and we offer multiple beverage options during each meal and throughout the day. Additionally, our menus are evaluated monthly by a registered dietician. A sample menu is listed below.